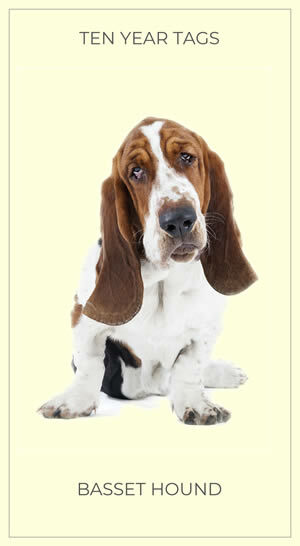 The Basset Hound is clearly the best dog in the world. Originally bred to drive out game in the field these dogs are dignified, loyal and gentle. They have a deep sonorous bark and would have enjoyed a career in opera had they not opted to be a Basset Hound. This dog needs plenty of exercise and mental stimulation to stay happy and healthy and don’t like being left along for too long. The Basset Hound is also extraordinarily handsome. Buy Your Bonnie Basset Hound a Deeply Engraved Solid Brass Dog ID Tag Today!